I cannot tell you how much we enjoyed this one. Every mouthful was packed with flavour and it felt like a real treat. This really is the perfect dinner party dish as it feels a bit fancy but it’s quite cheap to make and fills you up nicely! If you want to lower the points a bit further simply omit the chorizo, this will take the dish down to 9sp per person. Begin by making the base risotto. Heat the oil in a large non stick saucepan and once hot, cook the onion, garlic and chorizo for 3-4 minutes, then add the rice and fry for 2 minutes on a medium heat, allowing the rice to toast into the hot oil. I don’t usually use much oil in my cooking however in risotto I think it’s essential to ensure you get the right texture for the rice. Stir continuously with a wooden spoon. Pour the wine over the rice and continue to cook for a further minute to allow the alcohol to evaporate. Make up the stock with 500ml of boiling water and the stock cube. Add a couple of ladles of stock to the pan and bring to a simmer. Continue to cook and stir until all the stock is absorbed. At this point keep an eye on the pan as you need to keep stirring with a wooden spoon to make sure nothing sticks to it. Pour in the rest of the stock a little at a time, cooking until each addition is absorbed. While the rice is cooking you can get it with making the pea puree. Simply pop all of the ingredients in a food processor with a little splash of the stock from the risotto and blend until smooth. This can now be left until the risotto is cooked. Five minutes before the risotto is cooked, take a griddle pan, spray with 1kal and pan fry the asparagus until cooked to your liking. We like them crunchy so I usually give them 3-4 minutes and squeeze over a little lemon juice. Remove the asparagus from the pan and then add the seabass, griddling again on each side until cooked to your liking, I cook for 2 minutes per side. Once the risotto is cooked, remove from the heat and stir through the parmesan and spring onions. Then stir through the pea puree and finish with the juice of ½ a lemon. 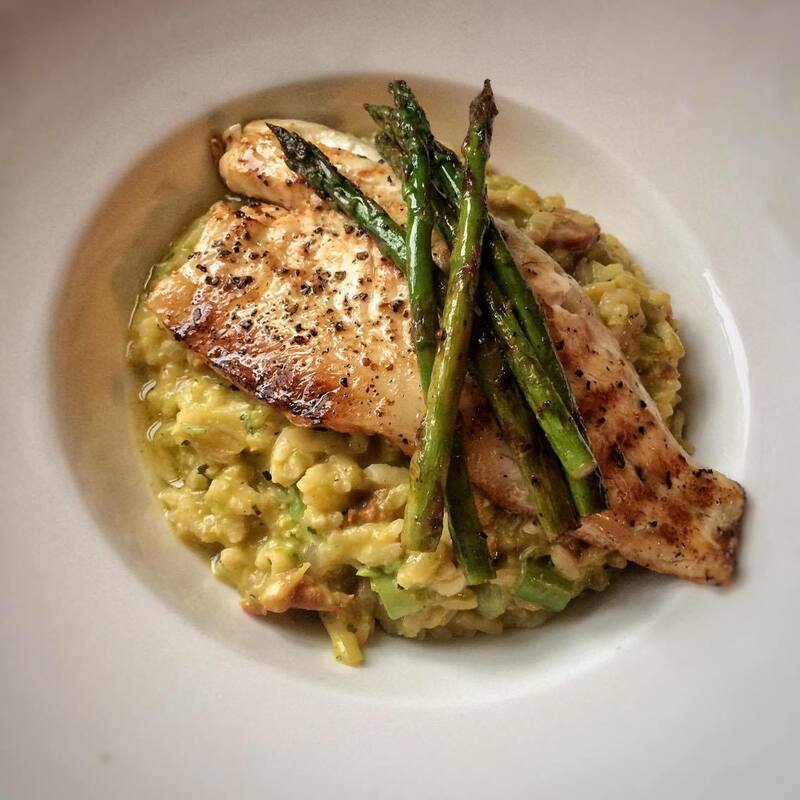 Pop the risotto in two large bowls, top with the seabass and finish with the asparagus. Serve with a ¼ slice of lemon per person.